JROTC students present the colors during the opening ceremonies back in 2017. The LSLL board and its volunteers, coaches, umpires and players have been working and practicing in preparation for this day. Games started on Monday, April 8, but this Saturday is the official start to the 2019 season. The league is still in need of umpires to volunteer for this season, as well as individuals to help with maintaining the complex’s multiple fields. This year features 48 teams, with approximately 550 kids participating in the various baseball and softball divisions. 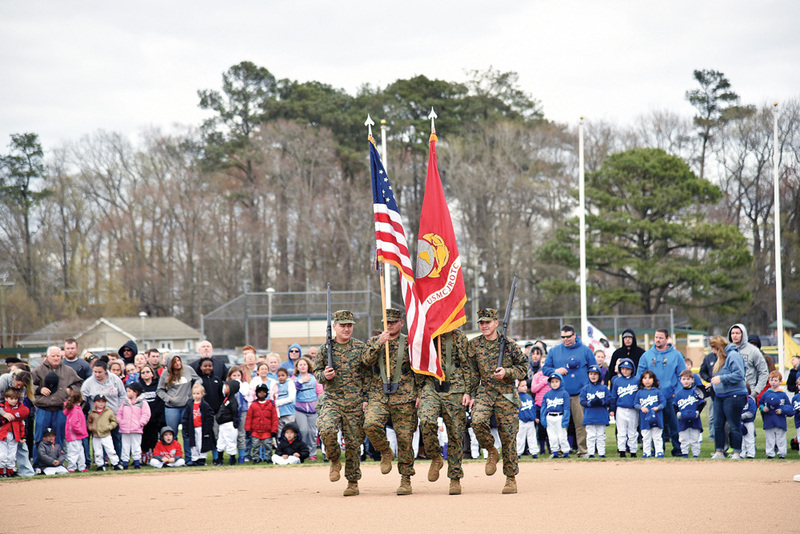 As part of the festivities, there will be a flag presentation by local veterans, and the national anthem will be sung by Southern Delaware School of the Arts’ Encore show choir. LSLL will also be recognizing its 2018 Delaware State softball champs, as well as numerous district softball and baseball champions. Razen Unlimited will kick-off the 2019 fundraising this year. They will select several volunteers on-site, and showcase the cash games that players will have the chance to participate in at the product pick-up. They will also be offering Mrs. Fields cookies and Abbey candles for purchase. While the weather is always subject to becoming an issue, organizers are certainly crossing their collective fingers that everything can go off without any precipitation dampening the excitement of the start of the new season.